And this shows why populism wins votes. 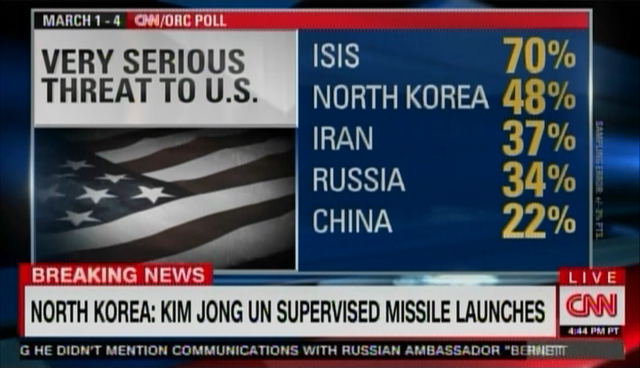 Because in actuality… first of all, there are only two countries on this list that represent an existential threat to the United States, Russia and China, and China only marginally so. North Korea is a threat mainly because it is unpredictable, but even if they develop a nuclear tipped ICBM, the country remains a distant third on the list of real threats. As to Iran and ISIS… they are no threat to the United States at all. ISIS has no capability other than inspiring some “lone wolf” attackers. Iran has no desire to engage in direct conflict with the US, nor do they have any serious capability to harm the United States; they may be “state sponsors of terrorism”, but their actual threat contribution is below the noise floor. So I think in terms of the real threat they represent, the order should be more like Russia, China, North Korea, ISIS, Iran. That is, almost completely the other way around. But when the commander-in-chief and his cabinet are blabbering about how they must protect America by shutting the doors on refugees, too many listen.